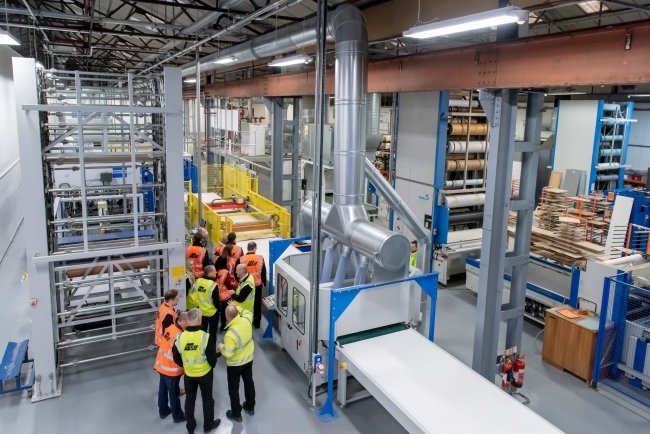 Furniture industry doors, boards and fittings supplier Hill’s Panel Products (HPP) has opened a second production line to increase its manufacturing of vinyl-wrapped doors for trade customers across the UK and Ireland. Oldham-based HPP manufactures its own-brand products including Avanti doors, Glide sliding doors, and Aspect and Aspire kitchens and bedrooms. It also supplies products by other UK and European brands. 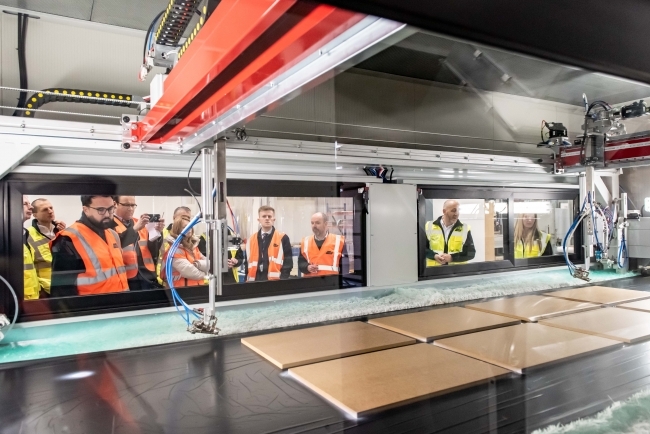 The new £3 million production line enables HPP to increase output of its bespoke vinyl-wrapped doors from 30,000 to 45,000 units per month in the short term. In the longer term, it can increase manufacturing to 50,000 per month or more. The new line contains automated routing, cleaning, glue-spraying and vinyl-wrapping machinery supplied by Wemhoner and Sittex. It currently offers 6,000 products which cover full and processed MFC (melamine faced chipboard) sheet material, vinyl-wrapped furniture doors and associated furniture fittings. HPP managing director Keith Wardrope said: “It’s great to see people of such high-calibre and enthusiasm as Jim McMahon and Sean Fielding taking time out of their busy schedules to visit HPP. We all share a desire to support manufacturing and economic development, quality careers and skills. “Automation can be seen as a double-edged sword, if it leads to job losses. However, HPP is using automation to secure jobs and to grow. Automation allows us to be competitive in the door manufacturing market by making production easier and more accurate. But because we are getting busier, we need to recruit more staff. “All our doors are manufactured to bespoke orders, with options on shapes, sizes, routing patterns, hinges and decors. The new line will manufacture doors across 40 styles and 70 colours, offering 2,800 possible combinations. Seventy or 80 per cent of our vinyl-wrapped doors will now be manufactured on the second production line while our first production line will focus on more-intricate orders. “HPP is now one of the leading vinyl-wrapped doors and kitchen and bedroom component manufacturers in the UK. We now operate 24-hours-a-day, five days of the week at Oldham, which is a considerable expansion of operations and staff. HPP finance director Richard Mottram concluded: “Support from Handelsbanken has been very important to fund our new manufacturing and building projects. Since 2001, our turnover has grown from £5 million to £34 million, which is excellent growth. Opening this additional line is an important landmark for our continued expansion and development, for manufacturing and for our support to the UK furniture industry.